Transportation officials in Puget Sound are increasingly seeing the waterway as a vital transportation route for its residents to reach the Seattle metro area to the east. Case in point, Kitsap Transit in 2017 launched its first fast-ferry service, linking Bremerton to downtown Seattle. Ridership has consistently beat expectations. The local transportation agency is capitalizing on that enthusiasm by adding two new fast-ferries to its fleet. Kitsap Transit contracted with Nichols Brothers Boat Builders of Freeland, Washington, to build the two additional ferries, with an option to construct a third ship. Each of the 140-foot-long aluminum catamarans are powered by two MTU 16V4000 M65L engines and two Rolls-Royce Kamewa S71 water jets, that we provided. The propulsion systems will also feature a Selective Catalytic Reduction exhaust aftertreatment system, which captures the engine’s exhaust and transforms it into a harmless mix of nitrogen, oxygen and water. The SCR helps the ferries meet Tier 4 regulations. “Our team worked closely with Nichols Brothers to engineer the SCR into the vessel’s design to maximize its effectiveness while providing the greatest environmental benefits,” said Doug Schwedland, PPG’s marine division vice president. Schwedland said the PPG marine team will work closely with MTU during the field test process to gather data and maximize the efficiency of each engine. This is a similar process we implemented with MTU for the operation and maintenance of engines used throughout a ferry fleet in the San Francisco Bay Area. 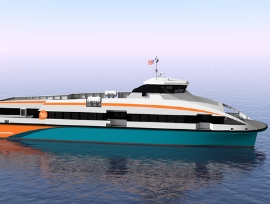 Kitsap Transit’s ferries will each carry up to 250 passengers and 26 bicycles, with a top speed of 37 knots and a cruise speed of 35 knots at full load. The passenger-only ships will expand the marine highway being developed to help ease congestion on the roadways in the notoriously congested Seattle-area traffic. Voters in Kitsap County, which sits west from Seattle across the Sound, approved funding for the passenger-only fast ferries at a time when the area’s population is booming. Residents want a faster connection to the city. The funding will allow Kitsap Transit to add routes between Kingston and downtown Seattle and Southworth and downtown Seattle in 2020. The expansion of ferry service in the Seattle area allows us to bring our expertise in this market. MTU designated our marine team as its preferred maintenance group to service its engines fitted for the San Francisco Bay Area WETA ferries.